Convert images or RAW photos in batch. New! Optimize all images for the web. Plus crop, resize, rotate, watermark. HEIC, GIF, PXM, PCL, PDF, RAW, etc. Convert TIFF, JPEG, WebP, RAW, etc. Optimize images for the web. Total Image Converter supports the widest list of output file types: PDF, TIFF, BMP, PNG, JPEG, JPEG2000, ICO, GIF, TGA, PXM, PS, PCL! Besides, it converts many rare formats like PALM, PICT, XPM, FIX. All Options of Total Image Converter Plus.. Some TIFF files can be up to 500 MB in size and most image apps won't be able to process them. Total Image Converter Pro can do the task. The new powerful engine support images up to 1 Gb. Converting imahes in batch Total Image Converter Pro will use all available CPU cores to speed up conversion. It's not another batch image converter. your image files in all possible ways. Nikon, Canon, Olympos, Sony, Kodak, Casio, Sigma, etc. "I am quite busy with the scanning of some 6000 slides. This will result in 6000 TIFF files of some 100Mb each. I bought Total Image Converter to convert these files to JPG. Thusfar I only used your software 2 times to convert a total of 5000 TIFF files to JPG. Everything went very easy." "I would like to thank Total Image Converter for converting my photos. It was a very stressful moment when I thought that I had permanently lost my files. When I recovered my files, Total Image Converter was the only program amongst many that converted them to jpeg." 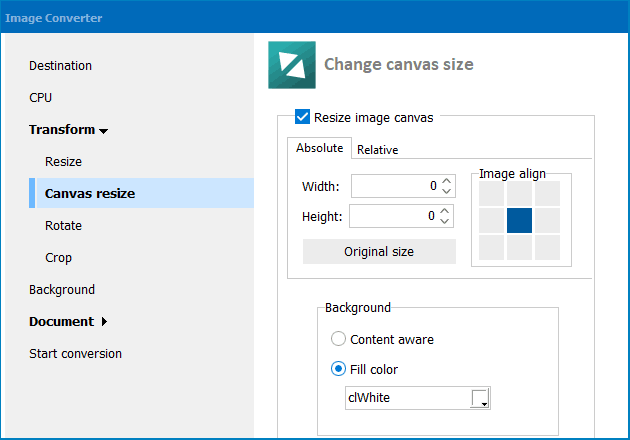 "I found Total Image Converter really easy to use for converting my high rez art files that were in tif to jpeg. It is going to be a really good feature for many people because I think Adobe will no longer save files in tiff. Thanks for having such an easy service." "It works fantastic. My only criticism is that the image converter hangs when used in the command line when being executed from a script running as a service. 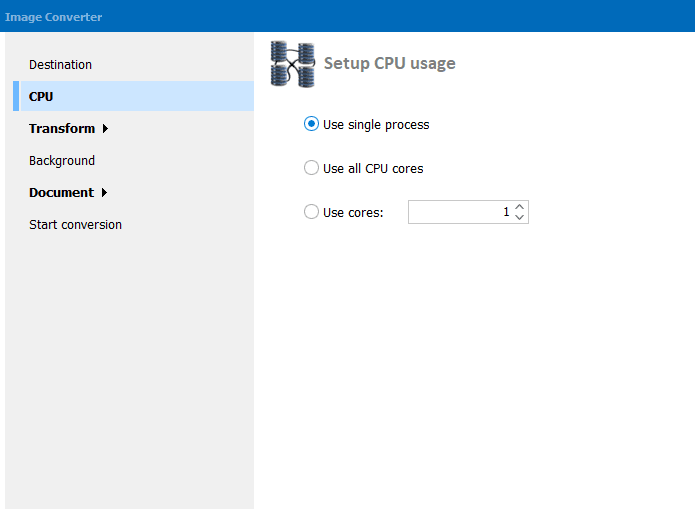 If you log the service in as administrator it works fine, but not otherwise. It hangs forever otherwise. Other than that I love it. You could have charged twice what you are charging and I gladly would have paid it." 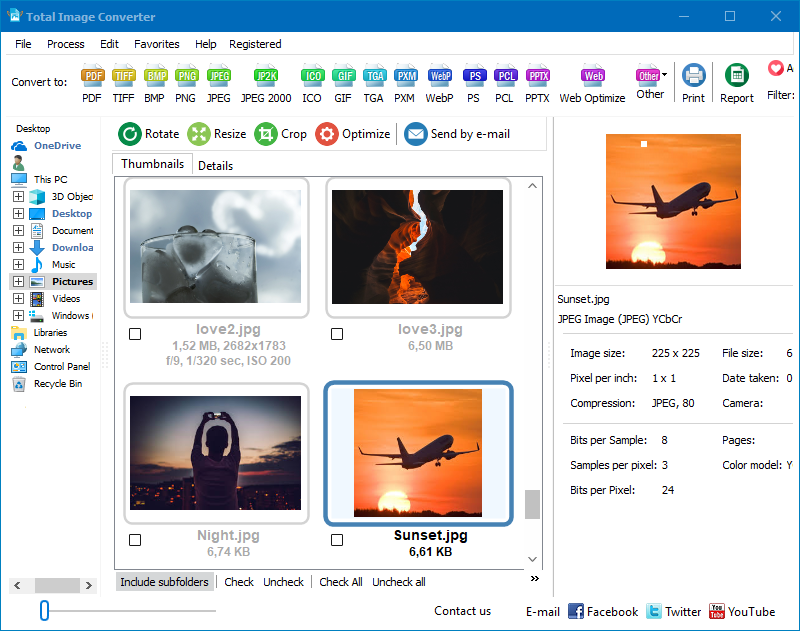 "I love this program it's so simple and complete, I would have save hundreds of hours if I had know about this image converter long ago. Thanks for a wounderful product. Sorry I don't do Facebook, Twitter or any other social site." Operating System: Microsoft Windows 10, 8, 7, Vista, 2003. Convert your images in 5 minutes. You are covered with the 30-day money-back guarantee. PSD, PDF, TIFF, BMP, PNG, ICO, JPEG, JPG, JPG2000, HEIC, GIF, PCX, TGA, PXM, WebP, PC, PCL, XPS, PPTX, AVS, CIN, DOT, DPX, FITS, HDF, MIFF, MTV, PALM, RAW, PICT, SGI, SUN, VICAR, VIFF, XBM, XPM. Raw graphic formats (RAW, CRW, CR2, NEF, NRW, PEF, RAF, X3F, BAY, ORF, MRW, SRF, MRW, DNG). PDF, TIFF, BMP, PNG, ICO, JPEG, JPG, JPG2000, GIF, TGA, PXM, WebP, PC, PCL, XPS, PPTX, AVS, CIN, DOT, DPX, FITS, HDF, MIFF, MTV, PALM, RAW, PICT, SGI, SUN, VICAR, VIFF, XBM, XPM.